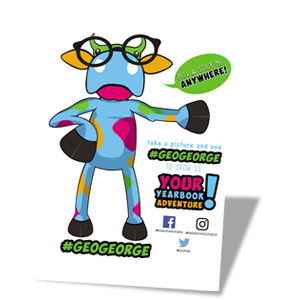 Make Your Yearbook a Social Masterpiece with the GeoGeorge Cling. GeoGeorge is small, but mighty. He clings to nearly every surface and pulls off cleanly. His purpose in life? To help bring the yearbook community together through social media. You can help out GeoGeorge by taking pictures of your yearbook creation journey, posting them online using the hashtag #GeoGeorge, and tagging Inter-State Studio’s social media accounts. We want to see your yearbook process! Include the cling in staff photos, stick him near your workspace and take a picture, or use him as a yearbook-buying incentive. Let your community know what to expect by posting GeoGeorge at school events that will be featured in the yearbook. It’s a fun way to get social and it is a constant reminder that a yearbook is being created for them. When a student purchases a yearbook, create a photo-op with GeoGeorge at their favorite place on the school grounds. Build awareness by posting these photos on the school’s social media (with parent permission) and/or dedicate a page in the yearbook to those who helped make the yearbook possible. You can order more clings here. Be social with us! Follow us on Facebook: facebook.com/InterStateStudio and Instagram: instagram.com/interstatestudio.